Boston native / Grammy winner, Bobby Brown, suffered a mild heart attack Tuesday PM according to the Associated Press. "Don't get me wrong - I'm really not zooped - Ego trips is not my thing ... I don't need permission - Make my own decisions - That's my prerogative" / to get my picture with him on the blog that is, lol. 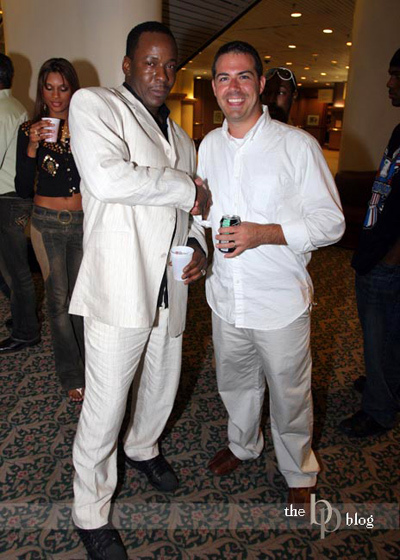 While people have mixed opinons about Bobby, I actually had the chance to meet Bobby at an after party, while on an assignment in the Bahamas shooting the 2006 Miss InterContinental Pagaent (Click here to see pics) He came across as a real pleasant and genuine guy and I wish him all the best.